Three Cranes Grove is hosting an Earth-Along to honor Earth Day this year. It’s three days of individual practice that we all do “together” (in our separate ways) to honor the Earth Mother. 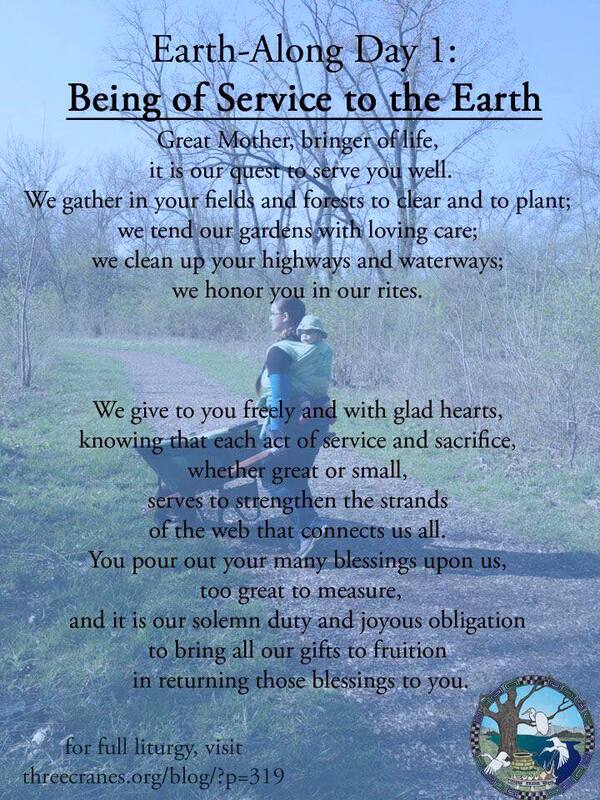 You can find a full liturgy of offering to the Earth Mother at the Three Cranes Blog today as well. I encourage you to find your feet on the Earth sometime today if you can do nothing else. For this day, as you do for all days. Last year I pondered the relevance of Earth Day at all, and the importance of Unless. I think those thoughts are relevant again this year, though with a slightly different slant. This year I opted to participate in Three Cranes Grove’s “Earth Along” – From Saturday to Tuesday, I did something in honor of the Earth Mother as a devotional practice in celebration of Earth Day. And maybe that’s not the same spirit that most of America approaches Earth Day with. It’s certainly not how I’ve ever celebrated in the past. In the past, Earth day has been about hard questions but token gestures, or reading The Lorax but taking home tiny potted trees that will surely die in the quickly approaching summer heat. (It’s 85F today.) In that light, Earth Day seems futile in the face of climate change, peak oil, fracking, pollution, and all the myriad ways that humans are exploiting the planet’s supply of non-renewable resources. If nothing else, today really is a good day to reread The Lorax – it seems increasingly relevant in our increasingly consumer oriented culture. (Do you need a thneed?) But I digress. I’m also feeling called to make this a regular part of my practice. I am not sure when I will fit in an additional offering, but perhaps I can just make watering my (newly planted) front beds a devotional practice in and of itself. Not having a garden this spring means I’m feeling out of touch with my bit of earth, and that’s never a good feeling for a Druid. I hope you find meaning in today’s celebration of the Earth, however you honor her. The prayer below is from the Earth Along, which I liked and I hope you like as well. And may your Earth day, and all your days walking on the Earth, be blessed. I’ve had a personal relationship with nature since I was a small child, when I had a “Nature Sanctuary” in the woods behind my house (there was a goodish sized clearing with an old stump), and I would have nature rituals there. How this managed not to attract the attention of my very Christian parents I will never know, but I treasure those memories, and when I go to nature in visualization I often start from my memories of that place. I like to meditate outside, and while I’m fortunate to live in a place where it is temperate except for during the summer (when it is miserable to be outside), that means I live with the Cult of The Eternal Yard Work, and during pretty much any daylight hours I can hear the sounds of yard machinery. During the week, weekends, evenings, mornings – it doesn’t seem to matter. I’ve even tried going to the local park to meditate when I get extra time, but there I am regaled by the sounds of the local airforce base. I feel an especially strong connection to nature at the beach. There is a magic to the ocean (and a feeling of being very small in the face of a very great power) that I find is both soothing and discomforting in a very good way. I try to get to the beach as often as I can, even if it’s just to sit on the seawall for an hour or two and listen to the waves. I love to meditate on the beach, where the sound of the waves becomes almost trance-inducing, and where the combination of warm sun, gentle waves (it is the gulf coast), the sea breeze, and the sand between my toes is like a healing balm for my soul. I have seen the truly powerful effects of the sea as well as the peaceful ones, so I am under no misconceptions about it being a force to be reckoned with. The sea I usually encounter is a gentle one, though, and I truly enjoy those moments of connectedness that I feel there. My other main connection to nature comes from caring for the little bit of Earth around my house. While I spend a lot of time outside, and am an avid gardener, I don’t meditate in my yard much because of the machinery noise, so I sustain my relationships either through active cultivation or through visualization inside where it’s quiet. My strongest connection to nature is probably through my garden and my yard, where I can have a direct impact. Gardening helps me to connect with the Wheel of the Year (even though I live in a place with odd growing seasons compared to those in Northern Europe) and to the powers that drive that cycle. It also puts me in touch with the Earth herself. While I more frequently address the power of nature (and the cycle of life and death) as masculine, I feel the Earth itself is strongly feminine. I honor my connection to the Earth as her child: as the saying goes “from you all things emerge, and to you all things return”. I suppose that means I honor the Earth as a Goddess in her own right, though in my rituals I sometimes give her a name (often Nerthus, but sometimes Jord, or Danu). I am just as comfortable with her just being Earth, or Gaia, or the Earth Mother, and I actively seek to make my presence here one of respect and honor. I know that the modern lifestyle is not always conducive to Earth-friendly living, and that dichotomy is something I truly struggle with. In light of that struggle, there are a number of things I do on a regular basis that seem mundane on the surface but are a crucial part of my Druidry. I compost as much as I possibly can – and buy compostable containers when I can as well. I use that compost to feed my garden, which I do not put chemical fertilizers on (though I do use an abundance of manure and supplemental compost, as the land here is almost entirely red clay). I also do not use chemical fertilizers or pesticides in my yard – with one exception: fire ants. Both my husband and I are ferociously allergic to fire ant bites, so they are my one pesticide exception. I also recycle as many things as possible, and try to buy recyclable packaging as much as possible. I use only re-usable bags at the grocery store, including some mesh produce bags that have drastically reduced the amount of plastic that comes through our house. We are also slowly replacing the light bulbs in our home with LED lights, as they use almost no electricity. Also, I keep the thermostat set very high in the summer (80-82 degrees in the house) to reduce our air conditioning usage. I try to buy cleaners that are biodegradable (or use things like vinegar and baking soda), as well as using personal care products that don’t use plastic containers or contain petrochemical-derived ingredients. What could I be doing better? Lots of things. My recycling efforts are notable, but I haven’t taken a stand against purchasing things that have nonrecyclable packaging entirely. I also sometimes get lazy and throw things away instead of cleaning them out to be recycled. I would also like to be a better advocate for my landbase. I live in a threatened area – the coastal wetlands. These wetlands are disappearing rapidly, due to a combination of human encroachment and changes in the waterlines, and while my area was not personally affected by the Deepwater Horizon oil spill, the plants and animals in this ecosystem are still threatened. I would like to look for some local conservation organizations to support, though that support will primarily need to be financial for now. Overall I feel like I’ve had my connections with nature pretty solidly created before I started the Dedicant Path, so over the last year I’ve spent my time reinforcing and thinking about those connections that I had already made. I also stepped up my efforts at living responsibly. 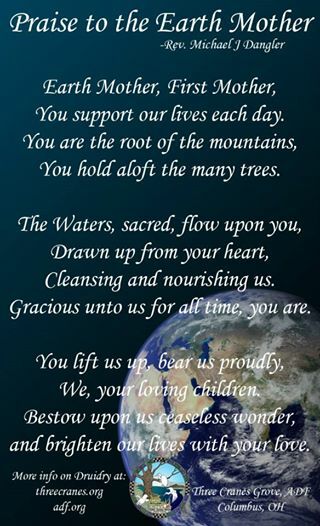 This is one of the aspects that drew me to Druidry, and while I haven’t always thought of it as honoring the Earth Mother as a Goddess, caring for the planet – especially the little corner I’m responsible for – is something I’ve found important for a very long time. I hope as I continue with Druidry that these connections will only deepen, especially as I make more relationships with the Nature Spirits as a Kindred. On the Future: Where is the Ground? Another excellent post from Sarenth Odinsson about the future, which seems to me a nice tie in to yesterdays post about the bees. We are coming to what seems like a turning point in the environment – whether that’s the loss of pollinators, the eventual running out of oil, the eventual burning out of the land we live on, the detriments of monocultured crops, the catastrophically changing climate, the droughts, the fresh water shortages and waste, the pollution of air and waterways, the mountains and mountains of trash… the list goes on and on. How do we abandon the outdated models of life and living so that we may, once we have found it, embrace the ground on which we are to build the future? Each of us must find a way to live in better concert with our local ecosystems. Each of us must consume less, grow more, and reuse everything to its capacity. What we consume must have some kind of long-term use. Land, both the sustainable preservation of and growth on arable land, and the preservation of wild places must be at the top of the priority list. No viable environment, and it will not matter what kind of future we try to make. Our communities need to bring its fundamental functions back down to a local level wherever possible. Our communities must support its local workers. Our communities must, in every way possible, learn to live with LESS: Less Energy Stimulation Stuff. None of this is easy, but that said, neither is waiting for Peak Oil to take full effect and you, as well as your neighbors, loved ones, friends, and so on, are left scrambling with no real plan to tackle the challenge at hand. Far better to get through the theories and on to practical application while there is still some time left. There is also the thought of ‘do not let the perfect become the enemy of the good’. Do I do all of the above? No. I do not own the land I live on, nor do I have a lot of control as to what comes into or out of the home, but I do what I can, where I can. Even raising awareness of Peak Oil is doing something, though the hard work, as mentioned earlier, will still need to get done sooner or later. I talk a lot about being the Druid of This Place – that our Druidry needs to take care of the local land as much as it does the whole Earth. Do I always succeed at being a good steward of that land? Absolutely no. My garden is small (only 10ft by 12ft, on a very large lot) in a large yard, and my corporate job means I spend less time caring for it than I probably should. I won’t grow more than enough food to be tasty and occasional for a short period in May/June, not enough even to store for the rest of the year. As a druid, this often bothers me. I feel like with the resources at my disposal, I should be doing more. But the thing about all of this? It’s hard to change how you eat, what you eat, how you purchase things, how you spend your spare time, how you live on your land – especially if you live in an apartment. It’s HARD. This isn’t “replace some lightbulbs” this is “fundamentally rethink your lifestyle”. As much as I try to do, I still drive 35 miles each way to my job every day, I still play video games in the evenings, and I still purchase things I don’t truly “need” (though I try to buy them from small artisans when possible, they’re still not necessary purchases). I don’t cook all of my meals from locally sourced produce, and I don’t even buy organic 100% of the time. I’m trying to get better at it, but I still fall short of a lot of what I could do to make my “footprint” smaller. I still have lots of skills to learn that would help me be more self-sufficient. Those skills take time though – time that I don’t have a lot of, not least because I spend 2.5 hours a day in traffic. I don’t really know how to put the two together. How do I continue to live my suburban lifestyle in a way that I can sustain while sustaining the future of the Earth? I guess I just have to keep working at it, and letting my spirituality help influence my intellectual decisions. I’ve talked about my concerns about the future of honey bee populations here before, but the bees are in the news again this week, with reports of 31% of colonies not surviving this past winter. If you’re not familiar with what’s happening with honey bees, I highly recommend the links above. They’ll get you the basic idea of this problem, which is widespread (worldwide) and not getting better. What can we do? Well, there’s not a lot of concrete knowledge, but there are a few tips floating around. Support organic produce – one of the big red flags for a lot of these studies is the presence of neonicotinoids, a type of pesticide that is neuroactive. It’s probably not the ONLY thing affecting the bees, but purchasing produce that doesn’t use these chemicals helps, in a small way, to reduce their heavy and widespread use. Keep your yard weedy – bees thrive on wild grasses and “weeds”, and a lot of farmland and yard land has done away with the native grasslands that bees need to get the nutrition they need to survive. Reducing pesticide and herbicide use in your yard not only directly helps keep bees from getting sick, it increases the variety of plants they can eat for survival. Cultural diversity in your yard may not look like a golf course, but it’s better for the environment for a ton of reasons. Stop using commercial pesticides – just like commercial herbicides are bad for bees, pesticides directly affect them. Move in the direction of organic garden and yard care. It might be a bit more work, but it’s better for you, for the environment, for your local waterways, AND for the bees. Plant a bee garden – it won’t look as manicured as a rose garden, but many varieties of plants are bee-friendly. Plant them in an area not near your walkways and home entrances (especially if someone in your house is allergic). This is a good list to start from (there are lots to choose!) if you’re not sure what kinds of plants are bee attractors. Even if you can’t devote a whole garden to your honey bee friends, planting bee-friendly plants, especially native ones, is helpful! Buy Local Honey – this helps keep local beekeepers in business. With so many hives dying out, apiarists are in high demand, and the more we support them, the better their chances of staying in business to help keep our food crops pollinated. If you’re not sure where to get local honey, or your grocer tends to only stock Big Name Brands that aren’t even guaranteed to be from the US, try asking at a farmer’s market or your local hardware store. I buy my honey by the quart at the hardware store, and it comes from about 20 miles from my house. Support Groups that Support Bees – Not everyone on that list gets a true thumbs up from an environmental perspective, but there are several research groups there that accept donations and are actively working to further honey bee research. It all seems like a drop in the bucket – and it is. There’s not much one individual can do in the face of a worldwide bee collapse that is likely being worsened by our commercial agriculture methods. But as with so many other things, every little bit helps. It is daunting, but I feel like it’s important to try anyway. So have some honey in your tea, and enjoy your almonds, blueberries, melons, and fresh vegetables. But don’t forget the bees that make those things possible. The bees need our help. If I find more information on how to help fund honeybee research, I will post it as well.